Last year the artists collective Fallen Fruit organized the year-long investigation EATLACMA, which included an exhibition, temporary outdoor installations, and a daylong event back in November. One public artwork remained once EATLACMA was over—the Public Fruit Theater, installed near the corner of Fairfax and 6th Street in collaboration with La Loma Development. It will remain in its corner of campus through next Friday, May 6. We asked Fallen Fruit for their thoughts on the theater. What was the original inspiration for the Public Fruit Theater? We’ve been thinking about public art pieces that engage the city for many years. Citrus orchards once covered vast expanses of Hollywood and Los Angeles. We wanted to address the origins of the city as a site, but also to create a project for another way to see the city of Los Angeles. Most of the parks and public spaces in Los Angeles are very conventional, with no references to what preceded our presence in the city. We always dreamed of creating some kind of park or outdoor site devoted to fruit trees that would be shared by the public. We’ve had a few public fruit parks in development that got arrested at various stages; it’s such a complex process. We’re thrilled at the results on the LACMA campus. The Public Fruit Theater is a space that is both public and agrarian, a way to commemorate what preceded our presence here. In this sense we also see it as a utopian proposal: why can’t our public spaces be productive as well as decorative? Why did you elect to collaborate with La Loma Development? Marco and Michelle of La Loma Development came to us highly recommended. We were impressed by their sophisticated design work, and the way in which it addresses both site and sustainability. In particular we were captivated by their choice of material. The chiseled pavement, which is recycled from the city sidewalks, is a material that expresses both a critique of public waste and a hope for a new beginning. The term La Loma uses for this is “Urbanite,” and indeed it reflects the urban character of its origin. They have worked with it for years and the result of our collaboration exceeded our hopes. What interested you about the site you chose for the Public Fruit Theater? We wanted the installation to evoke not just the history of this place, but also its utopian ambitions. Think of the old orange crate illustrations with snow covered mountains towering behind the orange trees. 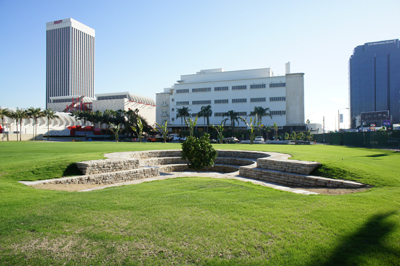 We love the sight line of the grass field, the LACMA campus and the Variety building—looming in the skyline above an orange tree in a sort of Meso-American looking amphitheater. The intersection of the past and future, agriculture, art, and Hollywood, seems like an arrow shot through the heart of our city. The whole Hancock Park area was once citrus groves, and the mountains people once saw in the distance have been displaced by enormous buildings. And to cap it off we know through the LaBrea Tar Pits that this area has been inhabited for thousands of years by native people. The orange tree comes from Spain (and originally China) via Mexico, and we wanted to create a set of resonances that involve colonization, settlement, and communal memory. What do you see as the role of public art? Public art should create a new public. It should activate the imagination of the people who encounter it. The model of the artist providing some kind of object for the world to behold seems outdated. We wanted to create a space that engaged people as a place to sit still and look at a fruit tree, but the space also asks people to look at each other. It should be a kind of reference point, a connection of past and present, but especially a site in which people have a moment in which to relate to each other. We like the symbol of the orange in opposition to the apple, which references temptation and sin. The orange is a symbol of the sun, of warmth and generosity, and Mediterranean traditions. How did the Public Fruit Theater change over time? We saw the “theater” in two senses. One is in a kind of theatrical space in which the landscape and the trees create a kind of concentrated zone in which a performance, small or large, might happen. People used this space casually, alone or in groups, and even for improvised or planned performances. It’s open to everyone. The other theater we love is the durational performance of the tree itself, the star of the show. This performance unfolds in a few acts: leafing out, flowering, ripening, and harvesting. To see the show in its entirety would take a year, a very slow kind of theater, the drama of seasons and nature. It’s the kind of show no one has time for anymore, but in a way it’s the most important show of all. The tree stands as a kind of symbol that connects the earth and the sky. Everything revolves around it. Did you get a sense of how people used it? We’ve noticed that people are really using the site as a place to have lunch of hang out, often with a friend or two. It’s meant to be a kind of communal meeting place. We hope people feel a sense of both intimacy and theatricality in our installation. While there’s a nostalgia for a past in which we lived in some kind of Edenic setting, there’s also a promise for the future. Why can’t we live like this? The symbol of the fruit is the core of this installation. We wonder if people will eat the fruit. Nothing symbolizes bounty and generosity like a ripe peach, plum, or orange. We wonder if people watch each other watching the fruit tree. This is something we thought about, a space to get people to both feel contemplative and engaged. In the end the theater is about us and the decisions we make about how our cities will look and how our lives might be lived in the future. This entry was posted on Thursday, April 28th, 2011 at 12:08 pm and is filed under Uncategorized. You can follow any responses to this entry through the RSS 2.0 feed. You can leave a response, or trackback from your own site.